He's a hero in his native Mexico and at star-chef conclaves worldwide. Now Enrique Olvera is bringing his formidable cooking to the US. He's a hero in his native Mexico and at star-chef conclaves worldwide. Now Olvera is bringing his formidable cooking to the US. 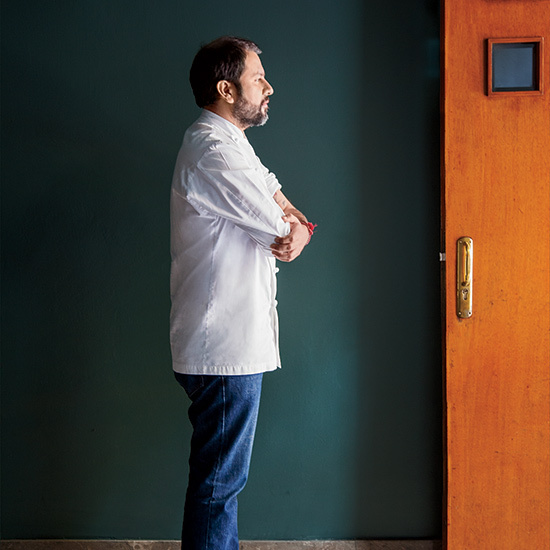 Each spring, Enrique Olvera of Mexico City's Pujol invites the world's top chefs to Mesamérica, the culinary conference he hosts. Olvera's peers have come to revere his brilliant take on Mexican cuisine: aging his mole sauces for 300 days, garnishing baby corn with crushed ants. He's about to become even better known when he opens Cosme in Manhattan, where he'll become one of the first Mexican chefs to break through big-time in America. Olvera describes the menu as "typical Mexican cooking that I love"—sea urchin tostadas served on a bed of smoked tomatillos; green spearmint mole with fried cauliflower. The chef is already thinking about broadening his reach. "Maybe the next stop is Brooklyn," he says.